Thank you so much for your assistance this past year. As you know, we could not operate without your help. All of our mission's awards pale when we compare them with your faithful support and your prayers on our behalf. We fervently pray that the year 2001 will bring you God's blessings. May He greatly comfort and guide you, and those you love. Thank you again, from the bottom of our hearts. 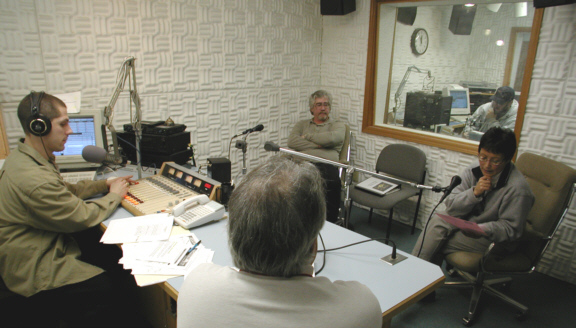 RECOVERY (left): In KNOM Studio C, news director Paul Korchin (with headphones) anchors a two-hour call-in program discussing the state's attempts to help village families who were devastated by the summer's salmon fishing disaster. Program director Ric Schmidt, facing away from the camera, co-anchored this important broadcast, which featured Don Smith of the Alaska Department of Labor and Bernice Joseph, deputy director of the Alaska Department of Community and Economic Development. Joseph flew to Nome especially for the KNOM program. Behind the glass in Studio B, KNOM volunteer Mike Nurse screens phone calls. RECEIPT: The third week of January, we will mail year-end receipts to everyone who contributed a total of $250.00 or more during 2000. Regardless of amount, if you would like a receipt, please write. Unless you request otherwise, all gifts postmarked on or before December 31st and received by January 15th will be counted as year 2000 donations. Thank you! WEBBED FEAT: www.knom.org is our mission's web site. We invite you to "surf on over" and enjoy all of the color photos and other information. Please join us. Between July 1, 1999 and June 30, 2000, it cost $827,614 to operate our mission. To ensure the most accurate view, we have added "Donated Labor" to our income and expense reports. Estimated at $155,000, this recognizes that the KNOM staff and volunteers are paid below market wages, and are, in effect, donating this amount to the mission. 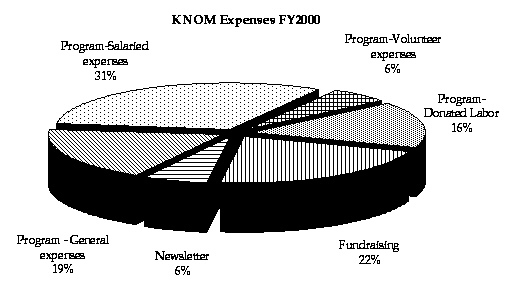 (Left) KNOM expenses, depicted on a pie chart. Fundraising was higher than our historical average. That's because we expand fundraising during successful periods, such as autumn 1999, and reduce it when things aren't going as well. "Other" income includes interest on savings and program underwriting. 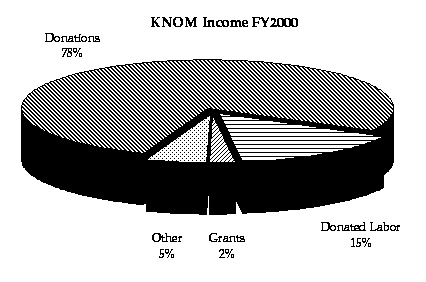 (Left) KNOM income, depicted on a pie chart. You can see how crucial donations are to our mission's day-to-day survival. We receive all contributions with gratitude and prayer. IF YOU'D LIKE a complete accounting of expenses and income, or have any questions, please write KNOM general manager Tom Busch and he will happy to send you any information you wish. INSPIRATIONAL SPOT: The rich must live more simply that the poor may simply live. 106: Broadcasts of the Holy Sacrifice of the Mass. 366: Broadcasts of the Rosary. 7,000 Broadcasts of traditional music from the Native Alaskan cultures. 8,784: Hours of information, inspirational programming, news, entertainment and positive companionship, thanks to you. 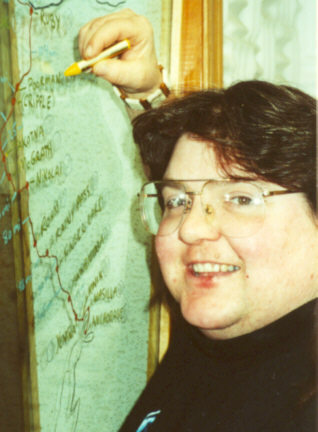 MISSION STATEMENT: KNOM is on the air to inspire, to inform and to uplift listeners in villages throughout 100,000 rugged square miles of western Alaska, to provide Catholic programming to remote listeners, to bring spiritual consolation and education to the needy, the hurting, the poor and the unchurched. January 10: KNOM began its 5th year of 24-hour-a-day broadcasts. The winter had been unusually dry, with almost no snow. That changed January 13, which brought a string of hurricane-force blizzards. In one week, Nomeites shoveled steps and walkways four times. 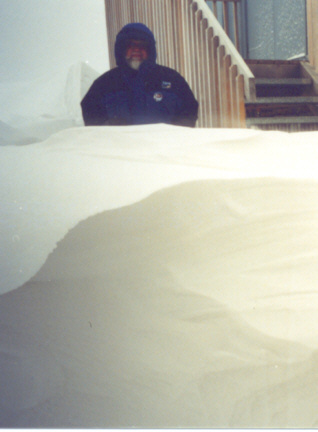 (left) Les Brown stands behind a drift at the transmitter. Mid-winter snow is extremely dry and packs together as hard as cinder blocks. January 20, between storms, KNOM volunteer Michael Warren flew to Unalakleet (YOO-nah-lah-kleet). The U.S. Census had selected village Eskimo elder Stanton Katchetag for the nation's first head count. On January 22, power failed in the teeth of a raging storm. Our 2-year-old emergency generator started immediately, returned us to the air within six seconds of the failure, and kept us on the air for 16 hours without complaint. February: KNOM operates with 25,000 Watts during the day and 14,000 Watts at night. In an informal vote, KNOM contributors agreed that we should request higher night-time power from the F.C.C. March: KNOM broadcast every Iditarod team's finish live, except for two dogteams which reached Nome during the Iditarod awards ceremony. 68 teams completed the race, most with dogs that looked ready for another 1,000 miles. 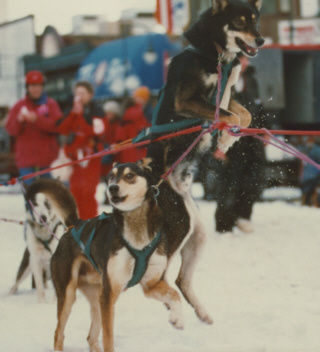 (left, above) An Iditarod dog can't wait to leave the starting line. (left) Former KNOM volunteer Linda Raab flew to Nome to help out, for the 13th year. On a grease pencil trail map on the studio window, Linda points to an incredibly remote spot known as "Wolf Kill." April: (left, below) KNOM general manager Tom Busch poses on the Las Vegas stage with, at left, Eddie Fritts, President and CEO of the National Broadcasters Association, and at right, Bill McElveen, Chairman of the NAB Radio Board. Tom holds NAB's Year 2000 award for Excellence. 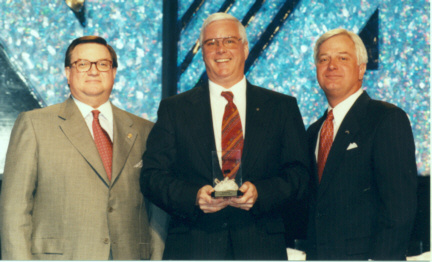 It was KNOM's second Crystal; NAB first presented KNOM its highest public service honor in 1987. In addition to the Crystals, KNOM has also been honored by NAB's other top award, the nationwide Marconi "Religious Radio Station of the Year" Award, in 1992. April 6: (left) KNOM's owner Bishop Mike Kaniecki, SJ recorded sermons and celebrated Mass in the KNOM front office, followed by a pizza dinner for the station's staff and families. Bishop Mike spent many hours visiting old friends in Nome and relaxing with the KNOM staff. June 10: KNOM Program director Ric Schmidt joined representatives of nine other award-winning radio stations at a gala Washington, DC dinner honoring excellence in broadcasting. 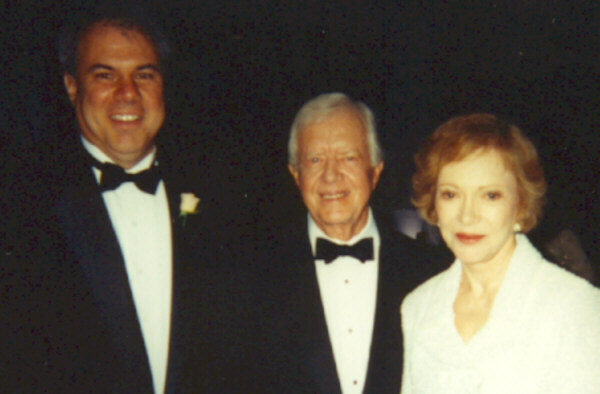 Among the other guests was former President Jimmy Carter (left). June 11: General manager Tom Busch attended former KNOM volunteer Ross Tozzi's ordination to the deaconate in Fairbanks. It was the last time anyone on the KNOM staff had the pleasure of speaking with Bishop Mike Kaniecki. July: For the first time in three years, the cost of groceries in Nome dropped to less than twice the cost of groceries in Portland, Oregon. July 14: Anticipating a tremendous celebration for KNOM's 30th anniversary in 2001, we observed KNOM's 29th birthday quietly. That month, both Alaskan stations that are closest to us on the dial agreed to allow us to test higher night-time power. July 30: (left) Using an International Marine Satellite telephone, KNOM broadcast an historic Jubilee Mass from abandoned Pilgrim Hot Springs mission, 50 wilderness miles north of Nome. 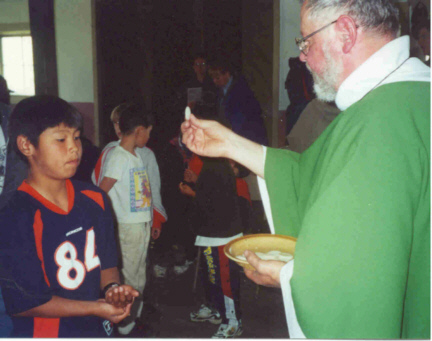 August 6: Bishop Mike Kaniecki, SJ died of a sudden heart attack in the Yup'ik village of Emmonak. 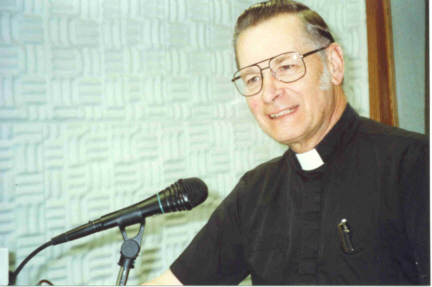 August 13: A Fairbanks broadcaster for 25 years, former KNOM volunteer Peter Van Nort produced a 2-hour broadcast of Bishop Mike's funeral Mass, allowing thousands of KNOM listeners to attend via long distance. 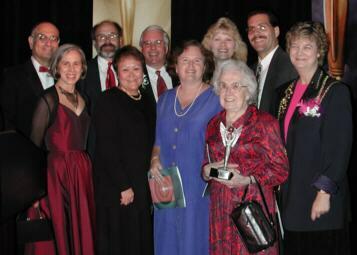 September 30: (left) KNOM friends pose with KNOM's 8th "Radio Station of the Year" Gabriel Award, and its 5th in a row. In Orlando, Tom Busch acknowledged "the thousands of benefactors who keep us on the air." October 6: The Alaska Broadcasters Association honored a KNOM inspirational spot and the station's Iditarod Race coverage with their prestigious Goldie Awards. November: Discussions began with FCC staff to determine the best way for KNOM to apply to test higher night-time power, which is an unusual request. It has been a remarkable year, filled with great joy and with great sadness. THANK YOU AGAIN for your wonderful help for our mission, the oldest Catholic radio station in the United States. As you can see from the charts, we are entirely dependant upon good people like you. May God greatly bless you throughout the coming year!